I sat on a bench today and tried another 10 minutes of nothingness. Again the crunching of footsteps, I flipped my eyes open. Tourists stopping to snap pictures of Morning Glories along the fence. In the film, Stephen Jenkinson sits by people who are dying. One older woman didn’t really want to face it. Sure, we’re all going to die. But we want to like to live like we’re not going to. Our culture is death-phobic. We must embrace death as part of our journey. It is a part of our humanity. There was a metaphor in the film about setting off the canoe, a metaphor for the body. When useful, the canoe springs leaks, and we patch it. But eventually it sets off from this shore. There was another metaphor for how we talk to and prepare our families for our certain deaths. We set the table for them. We must acknowledge the journey, like indigenous people; we must bring our family home. Not let them die in hospitals. But so many of us are cut off from our homes. It is a hole. We may refuse to acknowledge this hole in our soul. We fill it with narcissism or eating or drinking. I am pathologically happy-go-lucky. Is that my denial? Living with someone who is chronically ill, how do I talk about the inevitable, the illness, the feelings? I don’t really know anyone who is going through what I’m going through. Am I handling Chris’s Parkinson’s Disease well? Especially for my children? Is my optimism a bit of a veneer? The film reminded me to let people have their space. Don’t rush in and fill the void. Let there be sadness and joy; life and death are both a part of the journey. Let me have space too. It is all part of the loop. 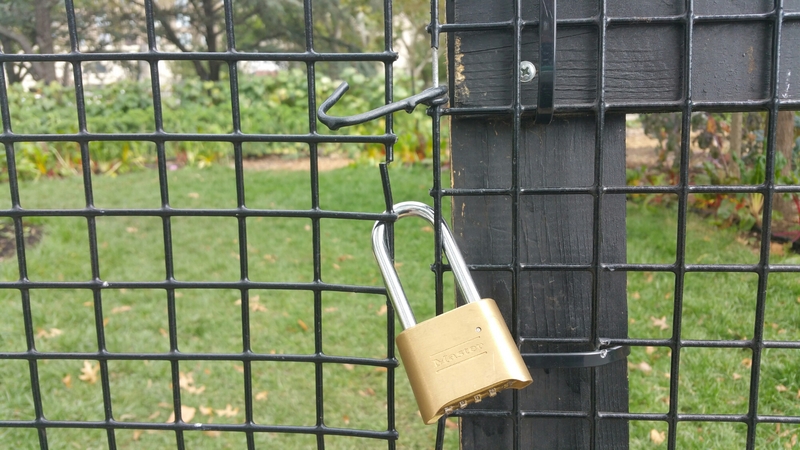 For my mindfulness project, I was going to walk the labyrinth in Battery Park today, but the gate was locked. So I sat on a bench, folded my hands in my lap, tried to clear my mind. Slowed down. 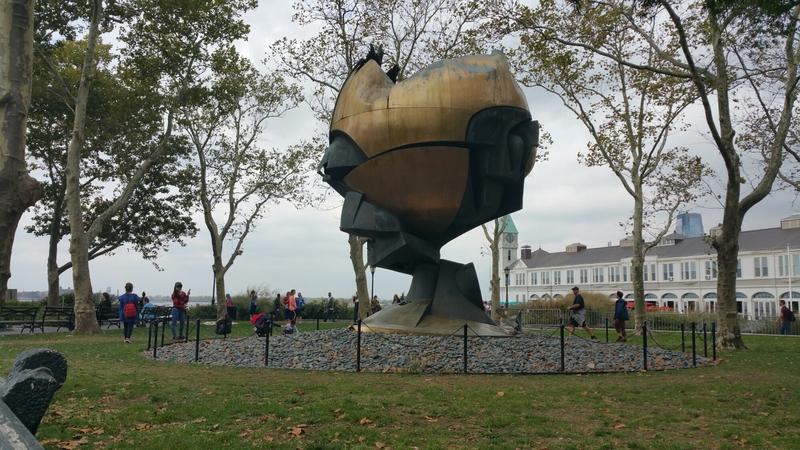 The Statue of Liberty was nearby, and so was the big sculpture that used to be in the center of the World Trade Center. I used to sit by that sculpture when I worked at the front desk of the Vista Hotel in the World Trade Center before work or during my lunch hour. The sculpture now rests in the park. Some people rush by. The sculpture is a metaphor for the hole in my soul, the sadness. It is okay to be sad. It is okay that the sculpture is there. Grief is not bad. It is part of our humanity. And so is this — a woman sat on the bench beside me, nursing her baby. I thoroughly enjoyed and resonated with your post. I WILL be back, am pinning 31 dayer blogs to revisit! This was so real. Loved your thoughts, and they inspire me to reflect.